This sounds like a variation on a theme of Thursday's blog, but after finding myself stuck with copious amounts of mango and pineapple which the child can no longer eat (you should've seen her face as I was chopping it up and had to say no, she couldn't have any) I had to make use of the fruit somehow. Bonfire night is traditionally fireworks and curry night in the Crowdey household. Well it was BC. But now we are AC with Miss AC, the closest we get to fireworks is arguing over why we never remember to phone for the takeaway an hour before we're actually hungry rather than waiting to pick up the phone when we're hungry and are considering cannibalism by the time it arrives. So no chance of a dinner recipe trial tonight. Instead, I dug out the recipe for the aforementioned sorbet which has been kicking around in my BBC Good Food binder for more years than I care to remember. It was one of those recipes that seemed like a good idea for a palate cleanser after a dinner party, but sadly, I've never held a dinner party in my life - hence no sorbet got made. Whilst I was contemplating this recipe, I did some research based on the comments that it was too hard to scoop. I discovered that there are no two ways about the ridiculously high sugar content if you want a relatively soft scoop. Fibrous fruit like mangoes, strawberries and pineapple work best. An ice cream maker is not essential although a mixing it during freezing every couple of hours will reduce the number of huge ice crystals. And you should temper it for fifteen minutes or so before serving. 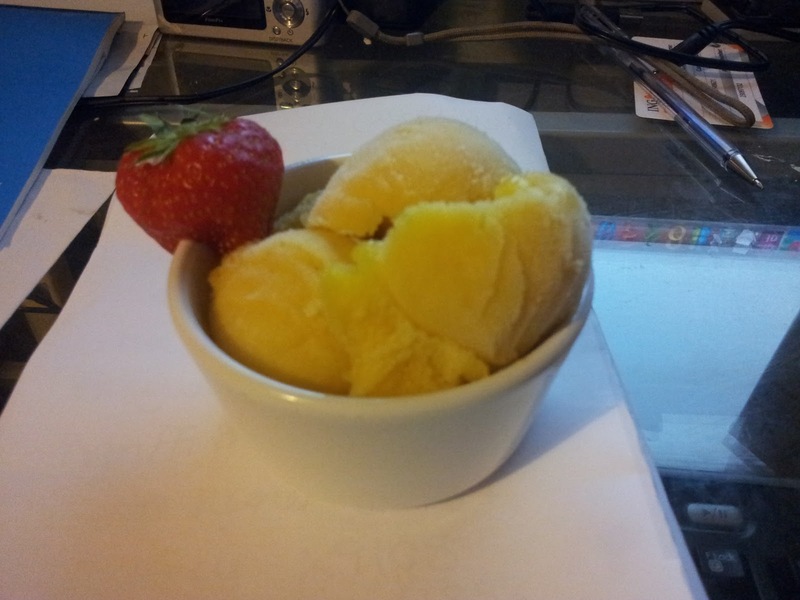 When the curry arrived, the sorbet was near perfect with just a tiny soft spot in the middle. By the time we'd eaten and then watched an episode of Frozen Planet - a-MAZING TV! - my sorbet was indeed reminiscent of an ice block. It was just about scoopable and I should probably have let it temper for fifteen mins before serving as advised, but being impatient to get the blog written, I forged straight ahead. It was a little icier than I would've liked. During the research I discovered that egg white may or may not help (beat in towards the end - it doesn't need to be whisked first though) but mostly commerical sorbet and ice cream is kept soft by the use of food grade anti-freeze. Nice! So I'll take my pure fruit slightly icy sorbet over commercial soft scoop sorbet every time. Need to work on the composition of my pictures! Simplicity in itself and cheek tinglingly tasty. Based on the comments after the recipe though, I halved the fruit content but kept the amount of lime juice the same as I was wary that some commented it was too sweet. This was definitely a good move in my humble opinion. One other top tip is to use a reamer to juice the limes. I have tried classic glass juicers, various electric ones (although not the citrus press that came with my Kenwood), heating the fruit in the oven or microwave and juicing it with a fork. But none of these techniques work as well as the wooden lemon reamer I got from Ocado. It's also a very satisfying activity. And I just like the word. Reamer. Put the lime juice, lime zest, water and caster sugar in a small saucepan. Bring to a boil and then simmer for five minutes, removing any scum. Cool. Blitz the mango, pineapple and lime syrup in a liquidiser. Pour into a freezer proof container and freeze for 4 hours. Giving it a quick stir every hour or so helps it to freeze better.